The Amateur Planner: Does your transit system have a pulse? Does your transit system have a pulse? In this post I'll describe something which is probably unfamiliar to big city transit system users, but which is very familiar for those who use smaller systems: a pulse. A pulse is a timed transfer between multiple routes in one location (or, in some cases, multiple locations) where buses wait for each other in order to allow passengers to transfer between them. Large systems with complex networks generally don't use pulses both because of the complexity of scheduling and bus frequency: a transfer will often only mean a few minutes' wait. But with 30- or 60-minute headways on many smaller systems, a pulse is an efficient means to create a usable network. The system must be small enough. With more than 15 or 20 routes, the complexity of scheduling every bus to one central point will overwhelm the pulse savings, and may also result in inefficient and overlapping routings to reach the pulse location. Some large systems may have pulse features in peripheral locations, or certain times of day. A convergence of routes. Trying to schedule multiple pulse meets at multiple locations is quite complex, and mid-route meets are operationally inefficient since buses usually need a few minutes of schedule padding to allow for variances in travel times. Most pulses take place at a central location where multiple routes lay over. So a network needs to be focused on a single location. Minimal traffic. 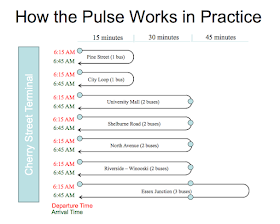 Pulse networks are based on buses keeping their schedules. In cities with heavy traffic, unless there are busways, a bus that is delayed for five or ten minutes may result in the rest of the pulse being delayed, or passengers missing transfers. Not too much crowding. Crowding on transit is generally a good thing, since it means that people are using the system. Too much crowding, in addition to passenger discomfort, leads to slower run times which, much like traffic can cause a pulse network to break down. In addition, crowding shows that more frequent buses are needed, and pulse networks provide coverage and predictability, but are not easy to scale, because to change the headways on one route, you need to change the headways on all the others. more difficult with an hour headway pulse. Routes have to be similar in length. Pulses work best when a single bus can make a roundtrip in an hour, including schedule padding. Issue arise when, say, a destination is 28 minutes of schedule time from the pulse location. You can't feasibly run it with one bus, since if that bus is at all delayed it will either delay other pulse buses or cause missed transfers. But putting two buses on the route is a poor use of resources, since each bus will now lay over more than half the time. So an hourly pulse network works only with routes where most round trips can be completed in under 50 minutes, and where others are long enough so that resources don't sit idle. This is less of an issue with 30 minute pulses, as routes can be shorter and still align with the pulse. San Francisco's late night transit services involve a series of timed transfers. Where are pulse networks run? Pretty much everywhere. For instance, many of the regional transit authorities in Massachusetts run pulse networks, even if they don't advertise them as such. For instance, if you look at the schedule for nearly every bus in Brockton's BAT network, it will leave the "BAT Centre" (or the BAT Cave, and after it receives the BAT signal; the Centre has received high praise from Miles on the MBTA; another feature of a pulse system is that it makes it worthwhile to invest in central infrastructure since all routes serve it) at exactly the same time. Buses pull in, passengers transfer, buses pull out. Simple. Once headways drop below 20 minutes, transfers become very, very difficult if they're untimed, which is why pulse systems make sense in lower frequency networks. Most of the time, transferring between subways in New York means waiting only a couple of minutes for a train. But after midnight it is often an exercise in futility if you have to change lines, since you may spend as much time waiting in a station for up to 20 minutes as riding the train. Without information on departures or guaranteed transfers, even the country's only full-service 24-hour subway loses much of its utility. 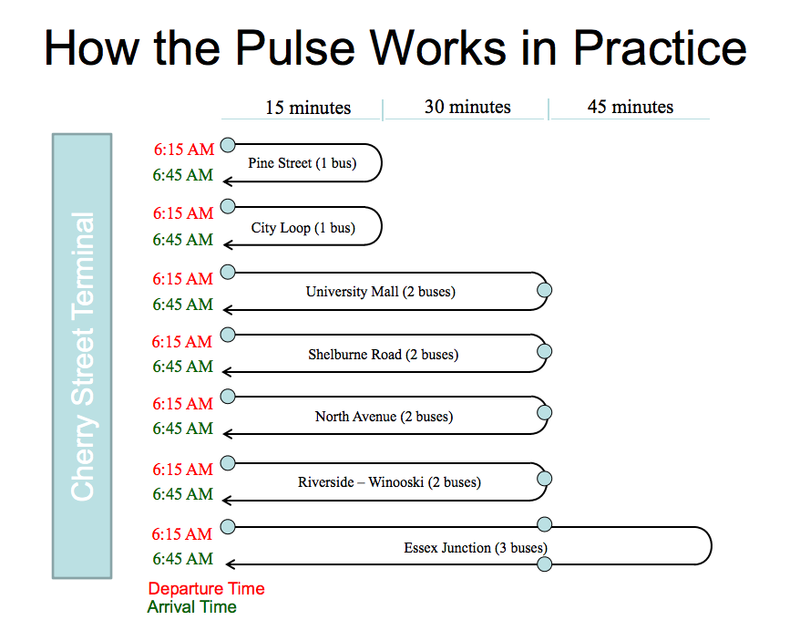 Jarrett Walker has a good if somewhat wonky description of how a pulse system works here, as does this presentation from the Chittenden Country Transportation Authority (in Burlington, Vermont, where I stole the graphic above). 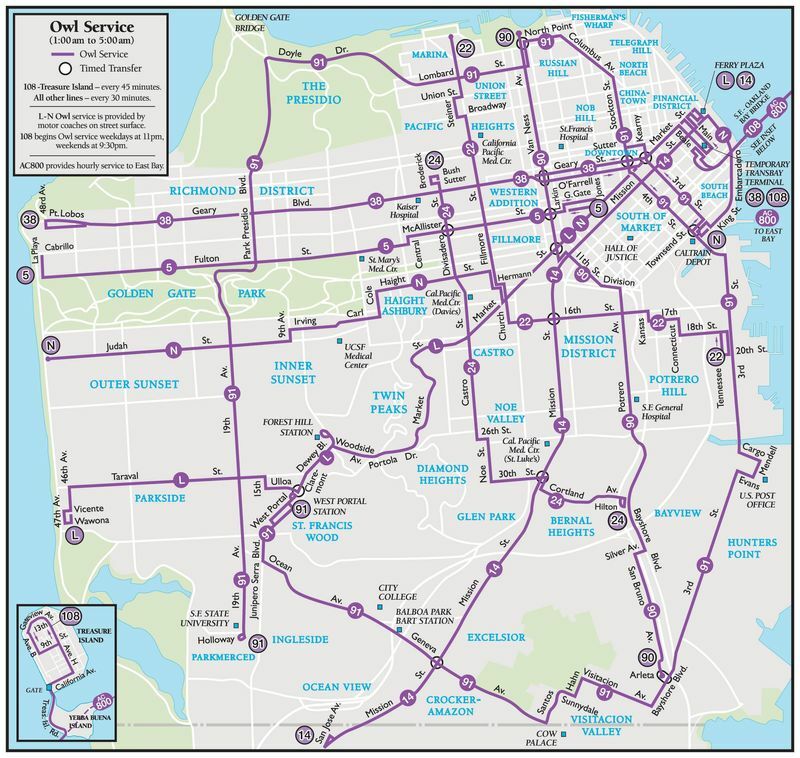 Even San Francisco gets in on the pulse system, for it's late night service most buses start in a single location, and a few other timed transfers are accommodated as well. In Boston, the transfers to the 117 downtown during early morning service are a proto-pulse, although with a more robust overnight service, a pulse would make more sense. San Francisco actually doesn't have a pulse system for late night service anymore. Most of those routes now run every 15 minutes all night, so there's no need to time transfers. If ridership of an hourly system was high enough, a 30 minute system could be put in to place. If ridership of that was high enough, then you could go to 15 minutes and remove the pulse. 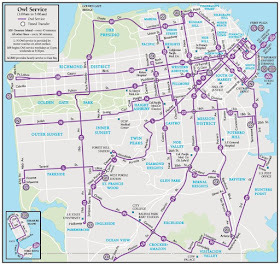 What's interesting about the San Francisco schedules is that there are some buses (I'm looking at the 5, for example) that have 20 minute headways in late evening service (11 to midnight) and then 15 minute service all night (on weekdays, anyway, still 30 minutes on weekends). Syracuse to NYC and Philadelphia To NYC you get cheap bus tickets and Lowest Price. No booking fees! I just love your blog, Thanks for sharing such a nice information about Grocery .